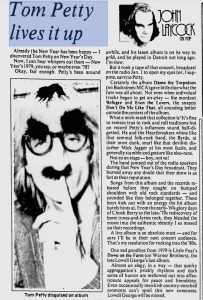 Already the New Year has been happy -- I discovered Tom Petty on New Year's Day. Now, I can hear whispers out there -- New Year's 1979, you say, or maybe even '78? Okay, far enough. Petty's been around awhile, and his latest album is on its way to gold, and he played in Detroit not long ago. I'm slow. 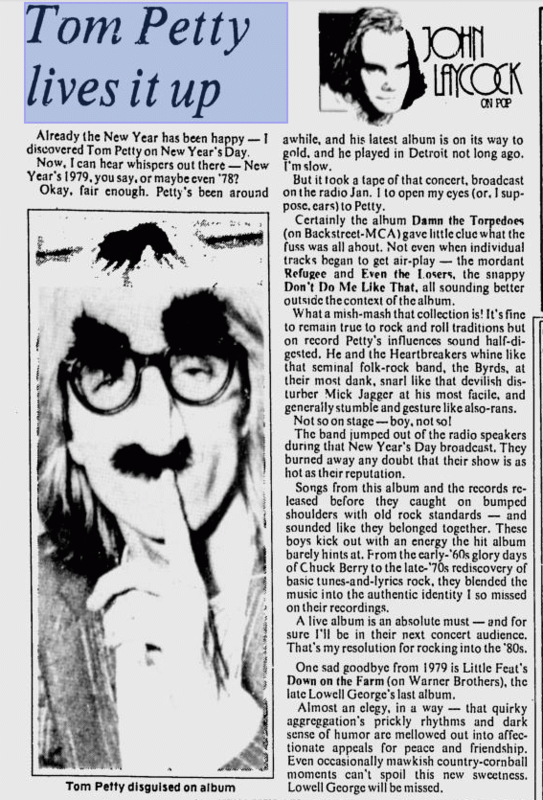 But it took a tape of that concert, broadcast on the radio Jan. 1 to open my eyes (or, I suppose, ears) to Petty. Certainly the album Damn the Torpedoes (on Backstreet-MCA) gave little clue what the fuss was all about. Not even when individual tracks began to get air-play -- the mordant Refugee and Even the Losers, the snappy Don't Do Me Like That, all sounding better outside the context of the album. What a mish-mash that collection is! It's fine to remain true to rock and roll traditions but on record Petty's influences sound half-digested. He and the Heartbreakers whine like that seminal folk-rock band, the Byrds, at their most dank, snarl like that devilish disturber Mick Jagger at his most facile, and generally stumble and gesture like also-rans. Not so on stage -- boy, not so! The band jumped out of the radio speakers during that New Year's Day broadcast. They burned away any doubt that their show is as hot as their reputation. Songs from this album and the records released before they caught on bumped shoulders with old rock standards -- and sounded like they belonged together. Thes boys kick out with an energy the hit album barely hints at. From the early-'60s glory days of Chuck Berry to the late-'70s rediscovery of basic tunes-and-lyrics rock, they blended the music into the authentic identity I so missed on their recordings. A live album is an absolute must -- and for sure I'll be in their next concert audience. That's my resolution for rocking into the '80s.